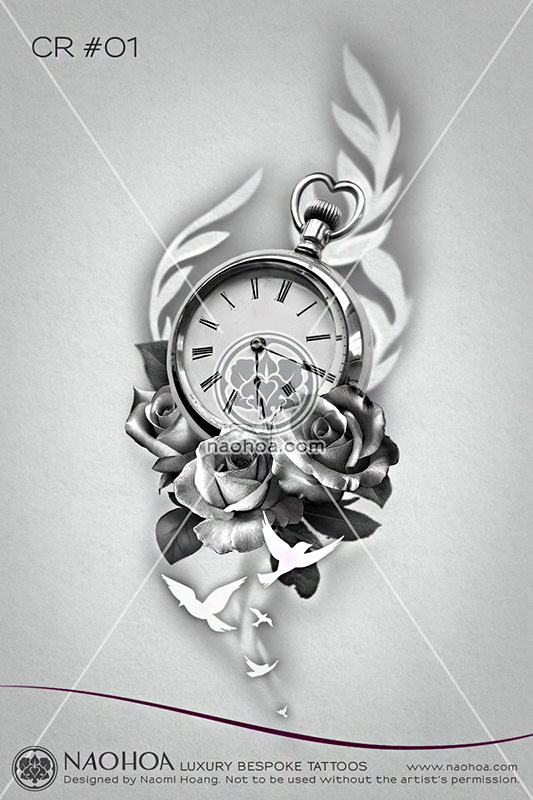 I received a cluster of requests around the same time for clocks and roses (inner arm pieces) and thought I’d share my design process for them. Aware of the popularity of this combination, I wanted to ensure each design was personal and unique to each client. Everyone has their own reasons to choose the subjects for their tattoos and I strongly believe it is my duty to fulfil that to the best of my ability…in a way where the client feels their tattoo is special for them and them alone. Transition from final design to linework for the stencil. This tattoo wraps around an existing one of Chinese characters and the client intends on having it extended into a Chinese dragon that ends at his chest. Bearing this in mind, I felt it would be fitting to do the clouds and water in an Asian art style. It’s still realistic (to tie in with the clock and roses), but the forms are stylised. I did this by omitting the hard outline that would normally be used in Asian drawings. By doing this, the art styles won’t feel disjointed to the rest of the sleeve when complete. This client was easy-going with her design so long as it had a clock and roses. Given her slim frame and feminine nature, I felt it would be more appropriate to incorporate this. Visioning white roses (rather than red) and using negative space meant the overall tattoo wouldn’t be too heavy on her. I already knew she preferred delicate tattoos having done a smaller one on her ankle beforehand. 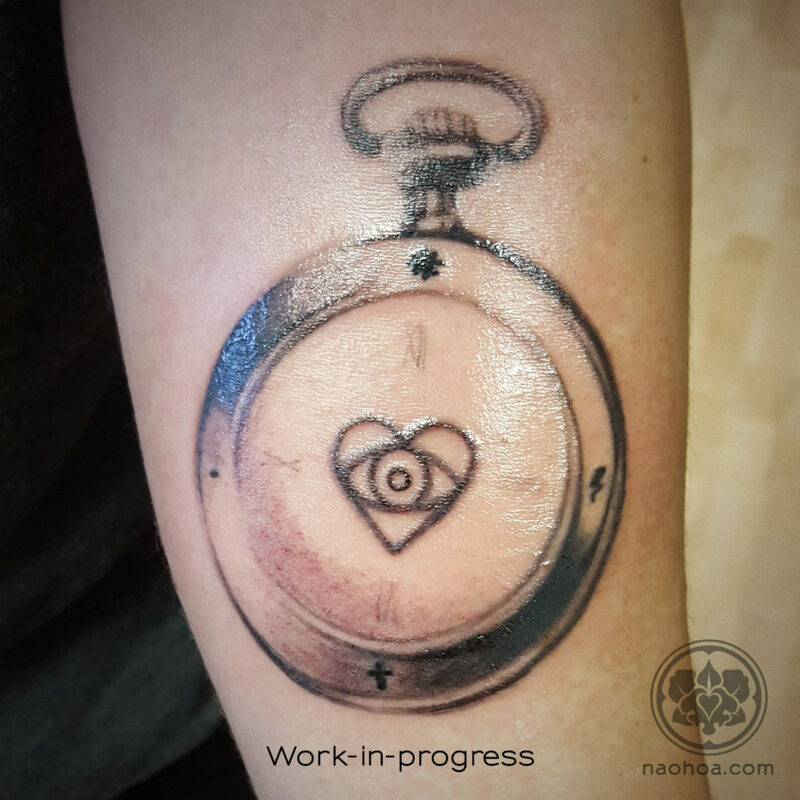 There were several things to consider with this design: It was his first tattoo, so the clock needed to work as a stand-alone piece, should he change his mind in wanting more; we thought it would be cool to slip in various references of his interests into the design; elements needed to be left out until after a big event. Overall, the brief was to provide a modern take with subtle references woven into the design. If you’re interested in ink, please get in touch and we’ll get the ball rolling! Behind The Scenes, Design, Tattoo Behind the Scenes, Black and White Tattoo, Creative Process, Custom Design, Design, Original Design, Tattoo. permalink.